Indoor Gardening Reaps Benefits for YOU and your Family! Have you been thinking about starting an indoor garden for your family? Indoor gardening provides the perfect opportunity to spend quality time with your loved ones while doing an activity everyone can enjoy. Maybe you have little ones who are curious about the world around them. Younger children especially will be amazed watching tiny seeds grow into thriving plants they can eat! Or maybe you want to get older children away from their video games, televisions, or smartphones. No matter the reason, indoor family gardening is a great way to grow fruits, vegetables, and herbs all from the comfort of your own home, a healthier alternative than store-bought foods. Here are a few additional health benefits of indoor gardening for you to consider. Why Choose An Indoor Garden For Your Family? If you think you’re low on growing space, have no worries! There are plenty of options to choose from when it comes to indoor gardening. 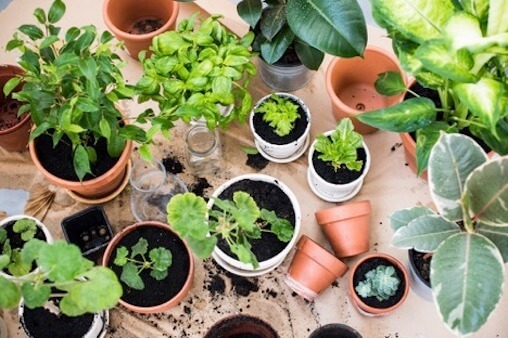 One of the easiest ways to get started is the simple potting method where you plant seeds in decorative pots or containers and position them in well-lit areas of the home for optimal growth. Such arrangements can be placed on window sills or shelves throughout the home or on their own bookshelf, creating a beautiful vertical garden. To get kids involved, have them decorate their own pots or label them with their names. Kids enjoy digging in the dirt, planting their own seeds, watering them and watching their plants grow. You can give kids plants to place in their own room so they can care for them personally for added responsibility. Improved Air Quality. Plants naturally filter the air, absorbing carbon dioxide and rejecting oxygen back into the atmosphere. This means your indoor garden produces naturally cleaner air for you and your family to breath. Furthermore, many plants absorb harmful substances including mold and other dangerous toxins. The likelihood of inhaling such adverse materials will be greatly reduced with indoor plants nearby. 100% Organic. Homegrown foods are also free of harmful herbicides and pesticides used for commercial gardening. By growing a 100% organic garden from inside your home, you ensure the best food options for your family. For example, an indoor herb garden growing on your kitchen window sill can be a steady source of savory ingredients for your favorite family meals. Furthermore, you can use some plants for essential oils or for making teas at home. Increased Vitamins & Nutrients. The health benefits of consuming a wide variety of fruits, vegetables, and herbs can never be denied. By gardening at home, you will be sure to provide a steady supply of vitamin and nutrient-rich foods that have not been manipulated by commercial farming methods. These are brain-boosting foods which will ensure your family’s health and longevity. Another great benefit of indoor gardening includes teaching children values. Indoor gardening imbibes in children the importance of raising homegrown, healthy food varieties. Children will be exposed to diverse plant life and will be able to cultivate healthy eating habits, while also taking pride in ownership from having grown their own foods. Indoor gardens also teach kids about nature and how the planet sustains life through the combination of soil, water, and direct sunlight. These are all important life-long lessons which provide an educational opportunity for your entire family (and an added bonus for parents is indoor gardening will definitely save you from the high costs associated with watering a garden in the yard!). So, what are you waiting for? Start indoor gardening with your family today and reap the many health benefits of growing your own delicious fruits and vegetables.